'Beatrix' Morris-Behind The Scenes Of Her Dental Procedure! ‘Beatrix’ Morris-Behind The Scenes Of Her Dental Procedure! 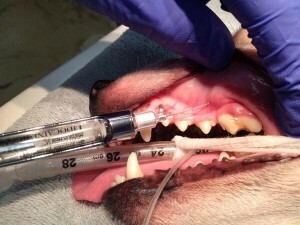 As a precursor to Dental Awareness month in February, Dr. Morris thought it would be interesting for you to see behind the scenes of his dog Beatrix’ dental procedure. I will caution you, some people may find a few of these images a bit graphic but we think it’s a great opportunity to see what happens during a dental procedure. 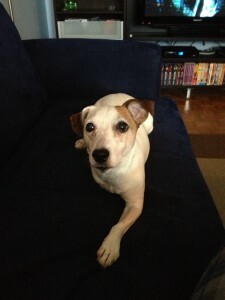 A little background: Beatrix is an 8 year old Jack Russel. For those of you who haven’t met Bea, she is a 3 legged wonder dog! The night before her procedure Bea came in for some pre-op testing. 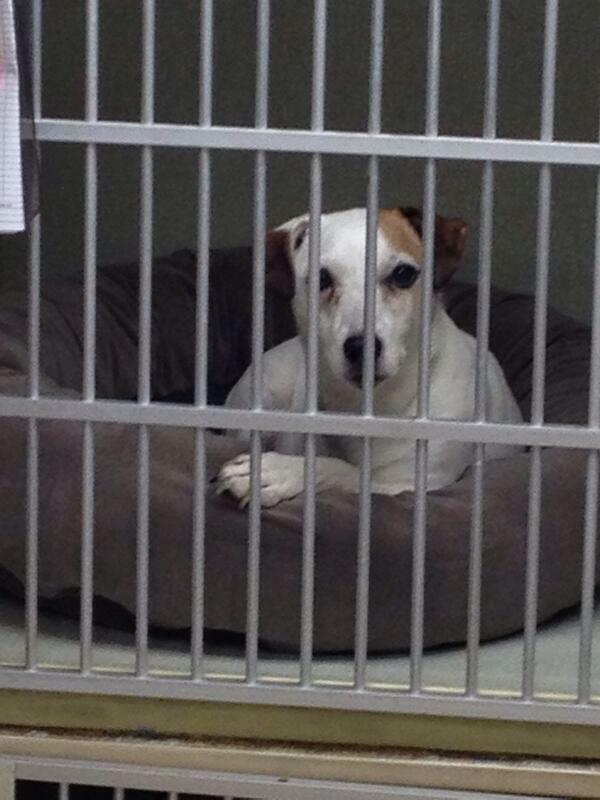 She had blood and urine profiles done to make sure she was healthy for the anesthetic. Then Bea stayed over with us! She was very cozy in her bed. so cute! In the morning Dr. Morris gave her another full physical exam. 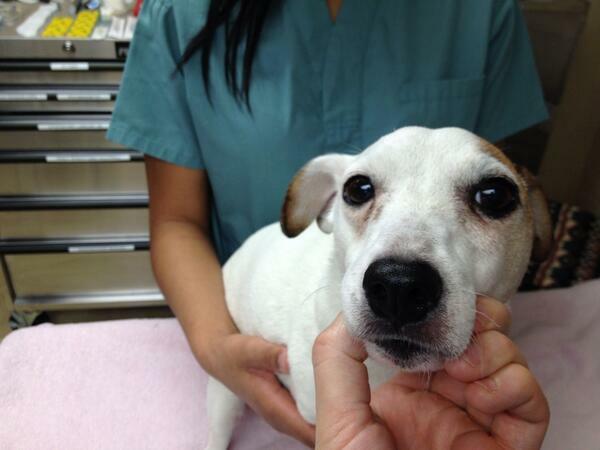 This is Bea on the exam table in our treatment room. If you look closely you can see the lump under her left eye. It’s at this time when the Registered Technician gives Bea an injection of a sedative and pain control to calm her before they start. Here is Bea now sedated. You can see how sleepy she is. 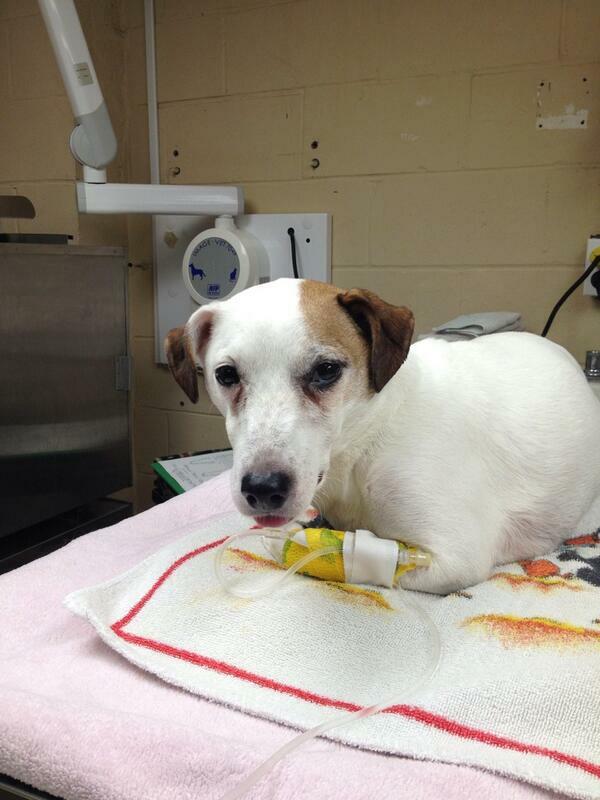 The Technician has placed her IV catheter and fluids and she is ready to go under anesthetic. It is also at this time where the technician and assistant will attach some of her monitoring equipment. We us a doppler machine that allows us to hear her heart beat at all times. We also use the doppler to closely monitor her blood pressure during the procedure. Once her doppler is on, the technician will administer an injectable anesthetic into her IV. This will sedate her enough to allow the technician to place a breathing tube in her airway and attach the gas anesthetic. Bea is now under full general anesthetic. At this time, more monitoring equipment is placed on her. You can see a grey clip on her ear; this is a pulse ox monitor and it monitors the amount of oxygen in her blood as well as her pulse. Bea is quite snugly under all those blankets! When animals are put under general anesthetic their temperatures will drop. We do our best to prevent this by using warming devices and lots of blankets. The technician will now take x-rays of all of her teeth. Here is the first x-ray of that questioned tooth. She has chipped the crown of the tooth but in this angle the root is missing? Here is a new angle! There’s the missing root. 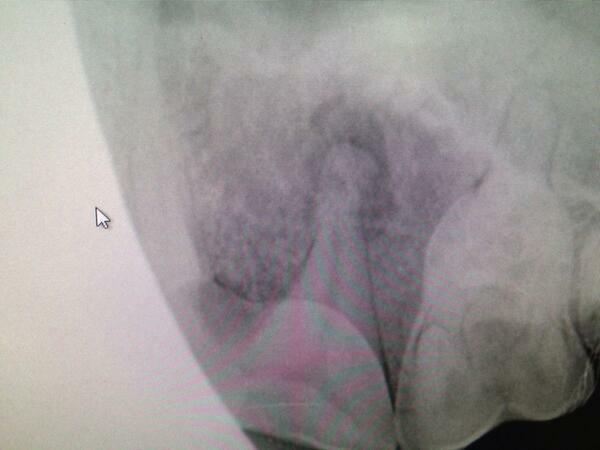 The dark shadow around the tip of the root is due to bone loss and infection! 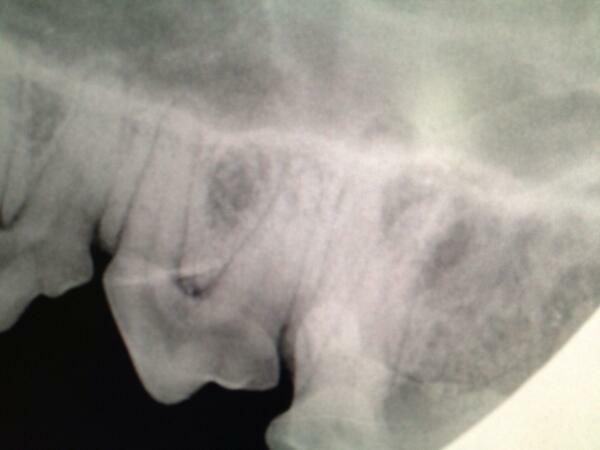 Here is the other half of the problem tooth. More signs of infection around these root tips as well. The best treatment is to extract the tooth. After the technician cleans and polishes all of her teeth, making sure she cleans under the gum line-the exact same as when you and I go to the dentist. Dr. Morris freezes the nerves around the tooth. This will make the extraction pain free. Freezing the tooth allows Dr.Morris to extract the tooth without having to deepen her anesthetic, making the procedure as safe as possible. After 40 minutes of extracting, the tooth is finally out and Dr. Morris places stitches. 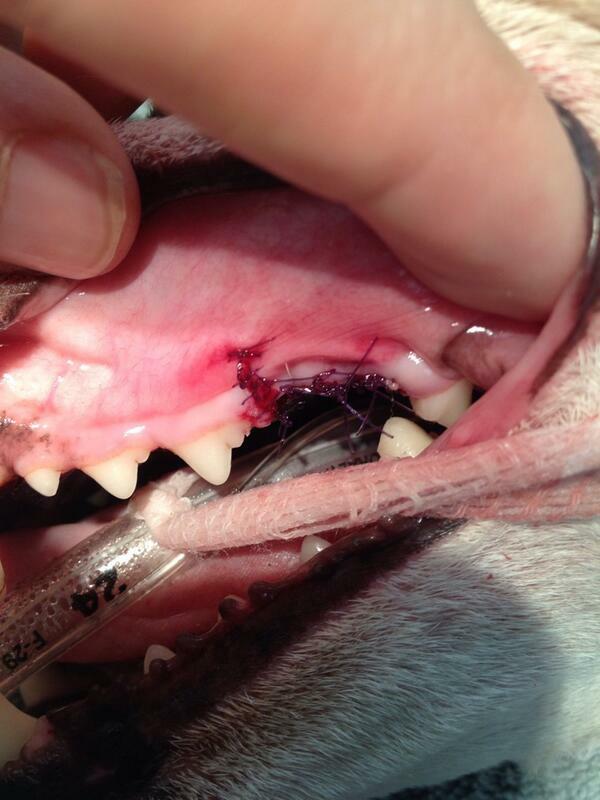 These stitches will dissolve on their own in a few weeks. 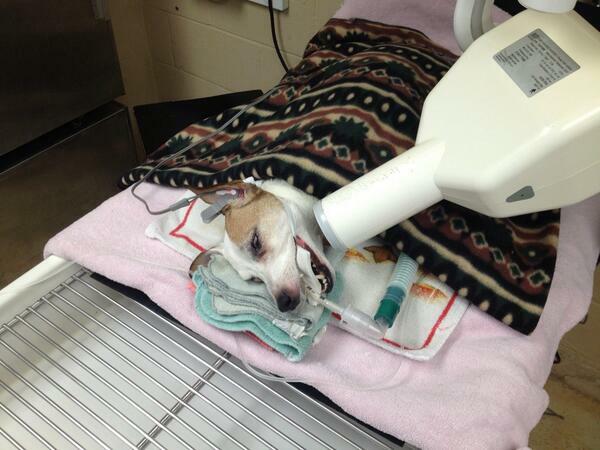 The procedure is over and her gas anesthetic is turned off. All of her monitoring equipment will stay on until she is completely awake. Dr. Morris, the technician and the assistant are sitting with her as she wakes up. Bea slowly wags her tail, she can hear Dr.Morris’ voice as she is coming around. 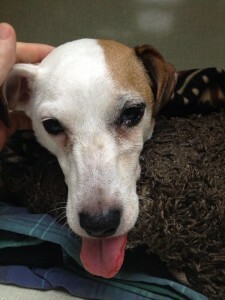 Remember that her mouth is still frozen and we gave her an injection of pain control before her procedure started. This will keep her very comfortable during her recovery. 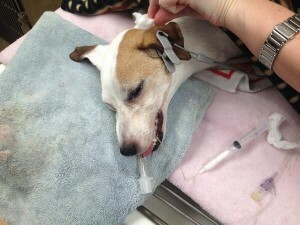 An injection of a long lasting pain medication is given to her right at recovery and Dr.Morris will also continue to give her some mild pain control while she is at home. 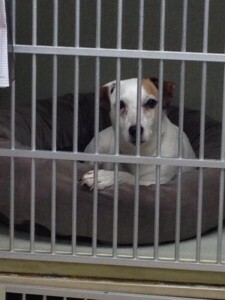 Bea is now back in her recovery cage. Still a little groggy, but very comfortable. The technicians and assistants will continue to keep a close eye on her. Once is is fully awake the assistant will take her out for a walk and will offer her some food. 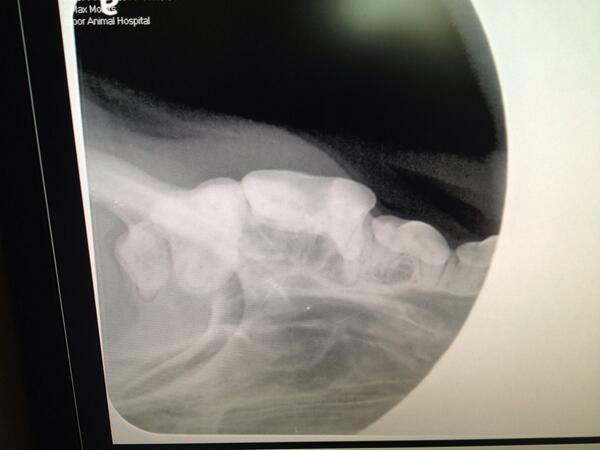 She will be eating soft food only for a couple of weeks to allow her extraction site to heal. It’s been a couple of days since her dental procedure and Bea is back at home and feeling better than ever! Look how happy she is!! 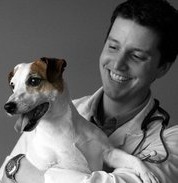 If you are concerned about your pets’ oral care, please see your veterinarian. We would like to thank Beatrix Morris for allowing us to document her procedure.